Tomaso Giovanni Albinoni : Adagio - François Couperin : Les Baricades Mistérieuses - Jean-Philippe Rameau : Le rappel des oiseaux. John Dowland : Forlone hope fancy. Domenico Scarlatti : Sonate K. 146 / L. 349. Johann Sebastian Bach : Prélude BWV 996 - Fugue BWV 998 - Prélude BWV 1006a. Padre Antonio Soler : Sonate n° 84. Fernando Sor : Largo opus 7 - Variations sur un thème de Mozart opus 9. Francisco Tárrega : Fantasia Traviata - Fantasia Marina. Isaac Albéniz : Torre Bermeja opus 92 - Cadiz, opus 47 - Mallorca opus 202. Enrique Granados : Danza Española n°10 - Danza Española n°4 - La Maja de Goya. Claude Debussy : La fille aux cheveux de lin. Miguel Llobet : Scherzo-Vals. Agustín Barrios Mangoré : El ultimo tremolo - Choro da Saudade - Cueca. Rameau, Jean-Philippe : Gavotte et ses 6 Doubles - Bach, Johann Sebastian : Fugue BWV 997 - Choral Prelude BWV 639 - Prélude BWV 881, Air BWV 1068 - Scarlatti, Domenico : Sonate K 380 en mi majeur - Paganini, Niccolò : Grande sonate en la majeur - Mertz, Johann Kaspar : Élégie - Regondi, Giulio : Introduction et caprice opus 23 - Tárrega, Francisco : El Carnaval de Venicia - Albéniz, Isaac : Sevilla opus 47 - Tango opus 165 - Zortizco opus 165 - Bajo la palmera opus 232 - Debussy, Claude : Golliwogg's cake-walk - Minstrels - Granados, Enrique : Danza Española n°6 opus 37 - Valses Poeticos - Llobet, Miguel : Respuesta - Agustín Barrios Mangoré : Danza Paraguaya - Maxixe - Variations on a theme of Tárrega. Rameau, Jean-Philippe : Suite en mi - Les cyclopes - Bach, Johann Sebastian : Partita II, en ré mineur BWV 1004 - Prélude BWV 889 - Mozart, Wolfgang Amadeus : Divertimento IV KV 229 - Paganini, Niccolò : Caprice 5 - Caprice 24 - Dubez, Johann : Fantaisie sur des motifs hongrois - Roussel, Albert : Segovia opus 29 - Albéniz, Isaac : Cataluña opus 47 - Aragon opus 47 - Castilla opus 47 - Granados, Enrique : Danza Española n°9 Romantica opus 37 - Llobet, Miguel : Variaciones sobre un tema de sor, opus 15 - José, Antonio : Sonata. Thank you Mr. Delcamp for these wonderful revised and beautiful pieces of work. You are so dedicated and work so hard, we are so lucky to have you do all this for us. Merci beaucoup, Jean Francois! Vous êtes trop généreux! Wow! Maybe in a year or so I'll be able to have a go at some of these. All I can do is repeat what has been said....wow. Thanks for this and for everything you do for the classical guitar. Thank you for accepting me in this group. At the present moment the scores are difficult for me to attempt, but I hope to play up to this level soon. Thanks to everyone in the forum and especially to M. Delcamp. Great work,keep it up.Your Dedication is an inspiration to all of us.Thank you for it;and thanks for my acceptance into this group. 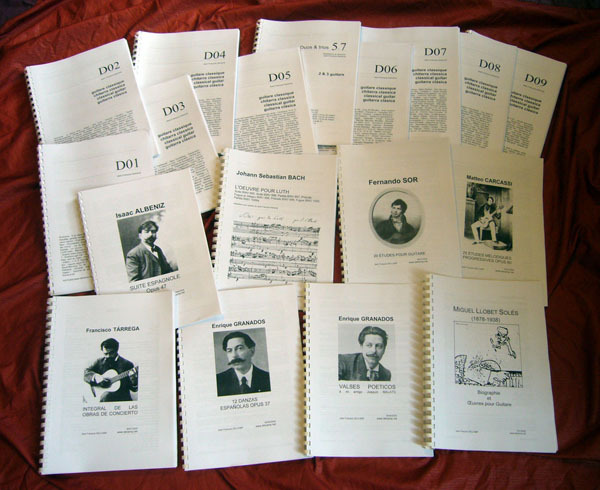 Thank you very much JFD for the amazing dedication to our instrument, these transcriptions are just great. Thank you very much for your scores. Thank you again Mr. Delcamp. This site and your hard work has given me a new found interest and motivation to continue to learn, improve and develop on the best instrument that mankind has ever created!